Are you longing to savor a classic tale on sunny autumn afternoons and chilly fall nights? Have you been eager to become acquainted (or reacquainted) with the refined world of Jane Austen? 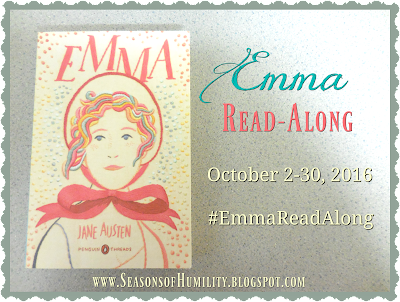 Then please accept this invitation to join fellow book-lovers for a read-along of Emma, beginning Sunday, October 2nd, and concluding Sunday, October 30th. P.S. Please feel free to take the button above and share it on your blog or social media page to announce your participation in the read-along! 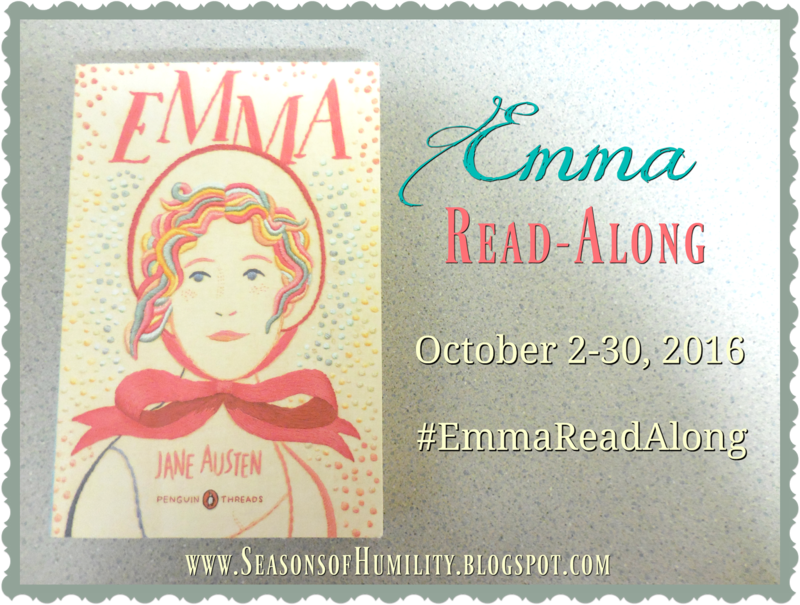 You can also join the conversation on Twitter using the hashtag #EmmaReadAlong. This tag was recently shared by the creative Courtney (The Green Mockingbird), and was previously shared by the clever Kara (Flowers of Quiet Happiness). Apparently, according to a comment I wrote on Kara's blog, I had been inspired to post about this tag back in March...but well, here I am in September! Oh well. I'm glad Courtney posted about it recently so I could be re-inspired! Side note: I knew I had done something like this before! I've actually already shared a couple of "fill in the blank" posts like this. You can read them HERE and HERE if you're interested in more bookish games! Eliyana has always recoiled from her own reflection in the mirror. But what if that were only one Reflection—one world? What if another world existed where her blemish could become her strength? Eliyana is used to the shadows. With a hideous birthmark covering half her face, she just hopes to graduate high school unscathed. That is, until Joshua hops a fence and changes her perspective. No one, aside from her mother, has ever treated her as normal. Maybe even beautiful. Because of Joshua, Eliyana finally begins to believe she could be loved. But one night her mother doesn’t come home, and that’s when everything gets weird. Now Joshua is her new, and rather reluctant, legal Guardian. Add a hooded stalker and a Central Park battle to the mix and you’ve gone from weird to otherworldly. Eliyana soon finds herself in a world much larger and more complicated than she’s ever known. A world enslaved by a powerful and vile man. And Eliyana holds the answer to defeating him. How can an ordinary girl, a blemished girl, become a savior when she can’t even save herself? 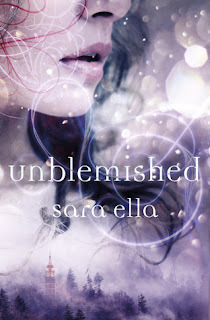 Unblemished is a very interesting young-adult fantasy read! The story begins in modern-day New York with the heroine, Eliyana, in a state of shock and mourning at the loss of her mom. But grief quickly gives way to confusion and fear when friends become strangers...and strangers may or may not prove to be trustworthy. Speaking of the heroine...Eliyana makes for an interesting narrator. Unfortunately, I didn't find her entirely likable for the majority of the book, but I wasn't so bothered that I couldn't keep enjoying the story. Her preference for periods (all. the. time.) was a bit annoying, although it does make the voice distinctive, and I can appreciate that. And, despite the things that are left up in the air, I did like how Eliyana was portrayed at the very end. You'll find some YA cliches in this story, but there's enough uniqueness and depth to make Unblemished stand out. One of the ways this story really shines is through the descriptions of the settings and the characters' emotions. The imagery is familiar and yet slightly foreign...vivid...enchanting. The author's individual style is evident in the writing. And the musical references and metaphors are a nice touch! All in all, this YA fantasy debut has some great writing, dramatic romance, and an entertaining adventure to offer. 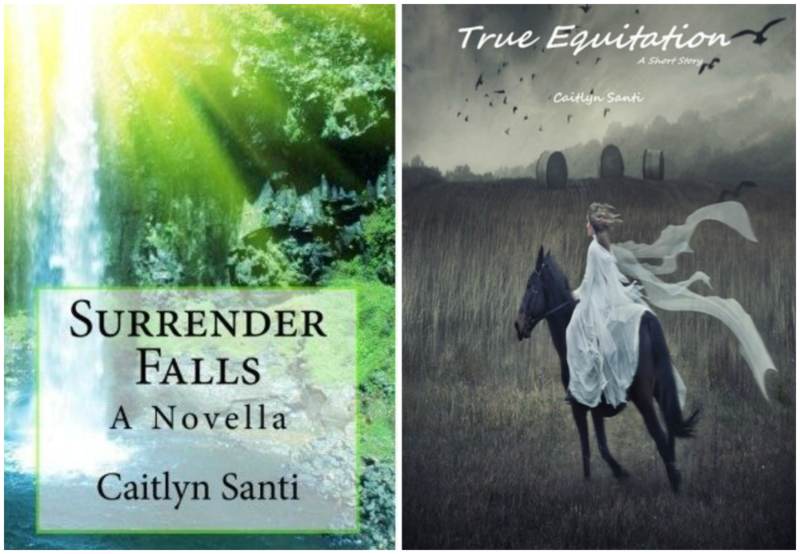 Today I have the pleasure of introducing you to a blogging friend (Just Your Average Reviews) and fellow indie author, Caitlyn Santi! She recently released a brand-new novella. :) Learn all about it in this fun interview, and enter for a chance to win an ebook copy at the end of the post! Amber: Welcome to Seasons of Humility, Caitlyn! Your new release is a young-adult Christian suspense novella titled Deadly Obsession. Could you share a little about the star character, Kennedy? What makes her shine—and what are some of the challenges she faces? Well, Kennedy is a 17-year-old girl and an FBI agent, and I think she may be the most fascinating and complex character I've written so far. She was a lot of fun to write because she is definitely a teenager personality-wise, but there are also many times when she displays a maturity beyond her years. Kennedy is very passionate and determined in her mission to do whatever she can to get predators who target teens off the streets. When the book opens Kennedy has just set up a sting operation to catch an online predator, and she appears a bit cocky and overly sure of herself, but we soon discover that because of a tragedy in her past, Kennedy has a large amount of anger simmering beneath the surface. That anger has led her to become an FBI agent and turn her back on God. Kennedy also struggles to balance life as a teenager with that of an FBI agent, and things only get more complicated when someone begins stalking her. Amber: One of the big themes of this story has to do with the love between siblings. What made you decide to focus on this sort of relationship? What makes such a relationship truly special? Caitlyn: My brother and I have a bond that I truly treasure, and I've always wanted to write a story about siblings. But honestly, the fact that it became a part of this book was a total God thing because when I started writing this story I had no idea that it would be about siblings until all of a sudden Kennedy's older brother, Wyatt, appeared on the page, and just like that the story changed for the better. Kennedy and Wyatt are best friends, they are always there for each other, and truly love and respect each other, but of course no sibling relationship would be complete without a lot of back-and-forth banter and good-natured teasing, which was an absolute joy to write. Wyatt is also intensely overprotective of his baby sis and Kennedy tends to be quite independent, so that makes for a super fun dynamic. I also want to let readers know that this is not a romance, and neither Kennedy nor Wyatt has a love interest. I personally find Wyatt to be a very dashing and swoon-worthy character and I hope to write two romance stories in the future featuring Kennedy's and Wyatt's love stories. Amber: That's really neat to know you also share a close relationship with your brother, as your heroine does! And I think that's a neat take on a young adult story, to focus on a familial relationship over a romantic relationship. Now, this isn’t the first story you’ve published. :) Was there something different or unique about the writing and publishing process for Deadly Obsession, as compared to your earlier releases? 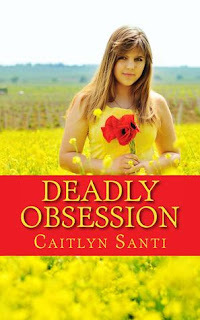 Caitlyn: I published my previous books just a few months after writing them, so probably the biggest difference is the fact that it took me nearly three years to publish Deadly Obsession after I finished the initial writing process. I was able to glean a lot of insights from the constructive criticism that was mentioned by several readers of my previous stories, so I spent a lot of extra time editing, revising, and rewriting Deadly Obsession, trying to make use of those suggestions. Self-doubt is something I struggle with every day as a writer, and while working on Deadly Obsession the fear of never being "Good Enough" rose to the point that it nearly stopped me from proceeding. It definitely wasn't easy but I guess eventually it just got to the point where I had to accept that even though I'm always trying to improve, my writing will never be perfect and I had to trust that it was good enough to put out there for people to read. I have to say that even though there were many times where I really started to wonder if this story would ever be ready for publication (and I don't doubt that there are probably still things I have missed that could have been done better or differently), Deadly Obsession is a story that not only strengthened me as a writer but also drew me closer to God. I wouldn't change a thing, except if I had it to do over I would turn my fear over to God way earlier, before it could paralyze me! Amber: It sounds like you've been learning some really meaningful lessons! What do you enjoy most about being an indie author, and what are some dreams/goals you have as a writer? 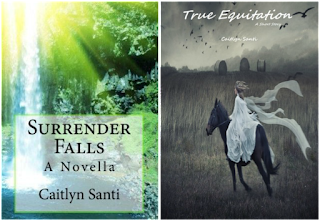 Caitlyn: I truly love everything about being an indie author. I love that I have total control of my stories, and that being an indie author has led me to learn skills such as editing, formatting, et cetera, that I probably wouldn't have ever learned otherwise. But, by far my favorite part is getting to share my stories with the world and having the opportunity to support all my fellow indie authors! I know it sounds cliche but I really just want to keep writing stories that honor God. If just one person is brought closer to God through my stories, that makes it all worth it! As far as dreams go, I would love to someday have the opportunity to write a book with one of my favorite authors, such as Dani Pettrey or Lynette Eason. Amber: That's great, Caitlyn! Before we end the interview, do you have a fun behind-the-scenes story you can share with us? Caitlyn: I mentioned earlier that Wyatt's entry into the story was totally God's idea, not mine. Well, God did the same thing when it came to Kennedy's faith story. In the original draft Kennedy was very strong in her faith and not much could shake her, but I kind of got the feeling that she was just going through the motions, that her faith had never been tested—in other words, she was a bit too perfect and the story was boring! So I began trying to come up with some way to really send her on a faith journey, but all my efforts amounted to nothing...until one night I was on my way home not even thinking about the story and the name Brooklyn popped into my mind followed by the knowledge that she was Kennedy's sister who had passed away tragically prior to the start of the story. From that point on everything fell into place, and I feel like the story is now a hundred times stronger than my original version. I truly believe that God gave me this story to write and I am so glad I listened to his nudges of my soul! And a fun tidbit that I learned while researching this story was that there have supposedly been scientific experiments that have led to the discovery that when certain chemicals (I think boron was one of them) are applied to a fabric such as cotton they can combine to create a bulletproof fabric. This knowledge really came in handy when I put Kennedy in a situation where there was a good chance she could get shot but yet it would be too conspicuous for her to wear a typical Kevlar vest. Friends, Caitlyn has generously offered to give away an ebook copy of Deadly Obsession to one of you! You can enter for a chance to win using the form below. The giveaway is open internationally and ends at midnight on September 13, 2016. The winner can choose their preferred ebook format (PDF, .mobi for Kindle, or .epub). "Break me, Lord, until I'm wholly yours." The title of this blog refers to a poem I wrote entitled Seasons of Humility. In the poem I express the struggle I have had with wanting my own way. I want to hold on to my own dreams, my own plans for my life. But I know that God has a plan for my life, one that will bring Him glory and will be even better than my dreams. So while the autumn and winter "seasons" of learning to let go can sometimes be painful and long, when the spring comes it is wondrous indeed. And through it all God never leaves me. The intent of this blog, then, is to share my thoughts as I continue on this journey of striving to be humble before my Lord. My hope is that my thoughts will encourage you on your journey, as well, whether my thoughts are on my day or on the books I have been reading! Amber Holcomb (Stokes) is an indie author and freelance editor living below the majestic mountains of Montana with her adventurous husband. Previously, she worked in marketing for a Christian publisher for nearly three years. Her passion for books compelled her to earn a bachelor's degree in English and now fuels her work with words in this new season of life. Share book reviews and ratings with Amber, and even join a book club on Goodreads.